This year will be my 19th year as a makeup artist. I count myself lucky enough to be a part of an industry during it’s ‘old school’ times and be witness to the transformation into ‘new school’ thanks to the rise of social media. I’m old enough to be part of the last generation to grow up without saturation of technology… where ‘social media’ to us was a high school newsletter or a handwritten love letter delivered to a letterbox. Where your Makeup portfolio was actually printed and displayed in a leather bound portfolio case you took to meetings. Sometimes I grieve for how things used to be… There was beauty in the simplicity and the industry was easy to understand Getting published in a magazine was an absolute highlight and one of the only ways for pure validation of work well done. Those days are gone. There are so many more channels for creativity now and the industry is more transparent than ever. Yet who can say what’s good or bad. The rise of social media has left a lot of seasoned artists, like myself, still slightly dizzy understanding the new world/industry and how we might fit into it, whilst still feeling like we are creating original and authentic work. For some of us during the transformation of the industry, as soon as we got to the edge of realising goals we had for our careers and working super hard for it… those goals seemed to change in value overnight (if you were an editorial artist) and the world of followers and likes seemed the new currency… and it came with no warning. Our only known and trusted measures of success had diminished in value to a certain extent and we weren’t prepared for how our world would change… let alone the tidal wave of new artists arriving on the dance floor without having to climb the ranks. Artists were forced to learn to adapt and embrace to flourish in the new world - In their own way. I definitely was a partial resister of social media until I attended an exhibition in Melbourne between Andy Warhol and Ai Weiwei. The exhibition opened my eyes to letting go the old and embracing the good that social media can do for your art. Up until then, part of me resented social media as it watered down the value of m own my success markers yet I wasn’t taking the time to fully appreciate the opportunities the new world presented. I was stuck grieving for the old world that I understood. Ai Weiwei showed me the good social media can be used for art and attributed social media to the new success and reach of his work. There are certainly artists who are using media like Instagram to purely grow their popularity and portfolios with cut crease eyes as makeup self applicators, void of professionalism. But that’s not all thats happening here. We don’t all have to strive to be ‘influencers’ for a successful makeup career. In fact… it seems that even makeup art for the sake of ‘followers and likes’ success is being challenged by artists who use social media as a platform purely for self expression - an extension of their work - not the focus. ‘Like and follower’ counts meaning nothing to self fulfillment. THIS is something I am very interested in. If you feel trapped under pressure to be a certain type of artist… look outside the lines… you do not have to be a ‘cut-crease-macro-lip-and-eye-beauty-makeup-artist-doing-online-tutorials’ to flourish as a MUA. (Unless that feels like your personal self expression… then follow your joy) I know this is still a concern for some artists as I see this conversation on forums all the time and hear it in my MUA Bootcamps. Some young artists not even fully realising there is a makeup world outside Insta/youtube fame. One artist who I have watched evolve and use social media as a platform for her own kind of art, is Brisbane based artist Georgina Ryland. 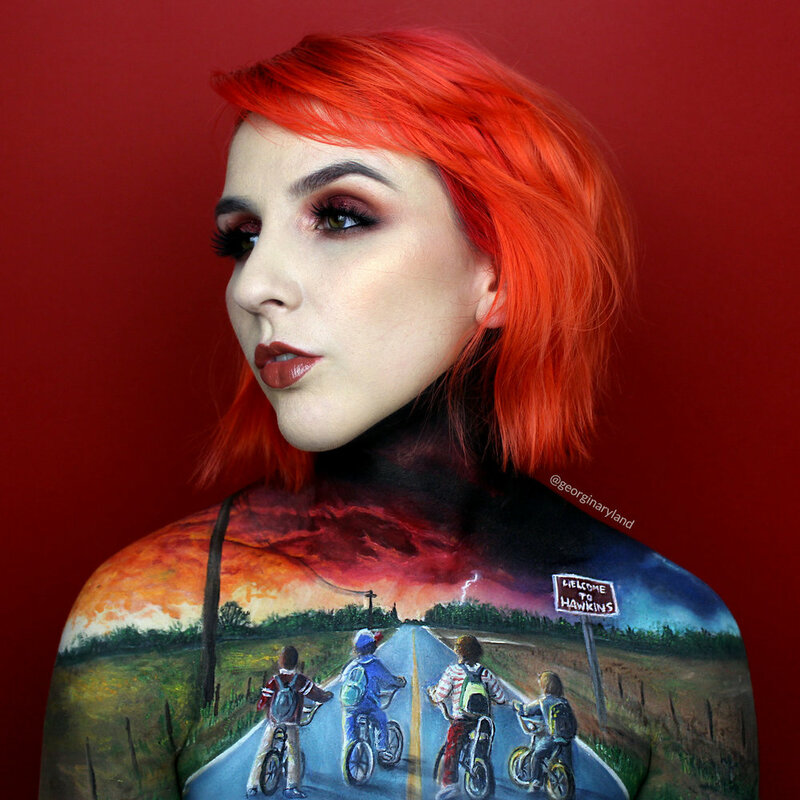 Becca - Georgina, you’ve used social media to explore your body art in such a beautiful way and before the social media life, your work would probably have been suitable for an exhibition on self introspection. You’re an artist who has been able to stay authentic to your own creative pursuits and use social platforms to share with us. The fact you now has 95.3K followers seems secondary to your creative objectives and a real validation that you don’t have to follow the crowd in style and content creation. On the eve of your appearance at the 2019 Los Angeles IMATS, It seems fitting to publish our recent chat. Georgina, remind me again… How did we actually meet? 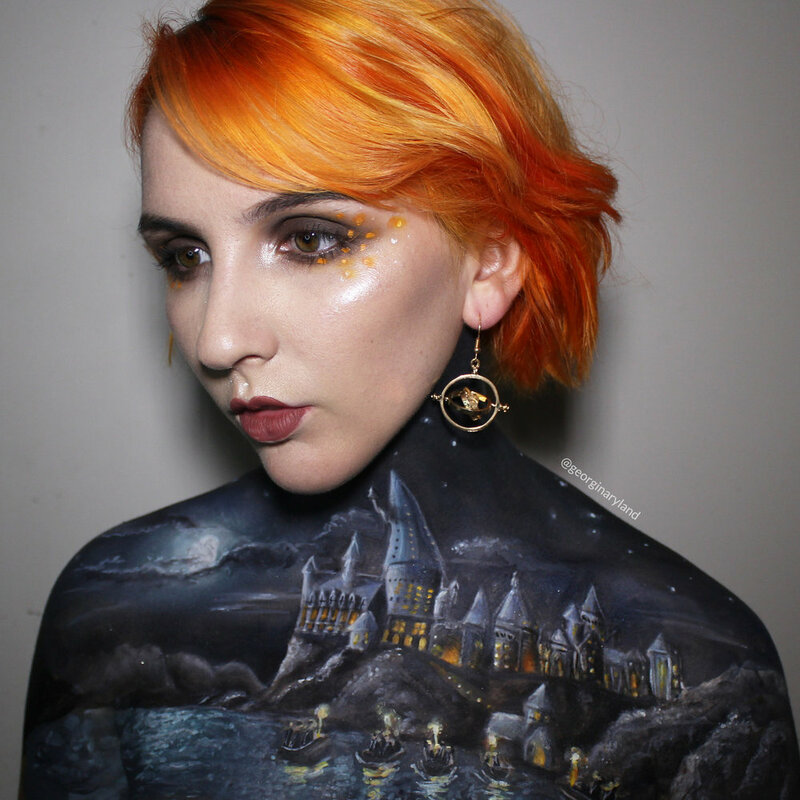 Georgina - I first saw your work and was inspired by you back in 2013 at IMATS. I remember seeing the green and blue floral and butterfly piece you did while standing with my mother there, just awe inspired that body painting was something that could be pursued as a career and an art form. I was currently studying at university and hating it, and IMATS was one of the starting factors of my change over into makeup so I’m grateful to have seen your work. I was introduced to the Green Brush Project by my teacher and now colleague Paige Badenoch - she spoke so highly of you (still does) and I was so excited for the opportunity that I emailed you (I still have it sitting in my inbox ha ha! I just found it) in the hope you would run a workshop soon. You spoke about releasing a book soon and how hopefully the Green Brush Project would be running again soon. I don’t remember exactly when I met you in person then; perhaps it was an IMATS or another event but I remember enrolling as soon as I could into the Bootcamp when it arose. B - Oh, I actually didn’t realise that my IMATS chat was the first domino in you realizing you could be a body painter! That’s so cool! That was a pretty magical weekend… it was the beginning of my obsession with understanding who we are as artists and the thought “surely there has to be more to this new word than just likes and followers”. I bet your painting at IMATS this weekend will trigger another artist or more into trying it out, I’m sure of it!. I’m so curious how other artists see themselves in the industry right now… What sort of artist do you consider yourself as? G - I am a makeup artist as well as a body painter; I started out by playing with face painting ideas and circus makeup and developed it from there. I refer to myself as a makeup artist most of the time as I feel it is a good umbrella term for my work but I feel the need to clarify body painter as well. For work, I’ve been trying to focus a bit more on my mental health recently so I have paused freelancing but I do clients when I am sought after (I’m not advertising it currently). I am currently working at my old makeup school, The Australian Academy of Cinemagraphic Makeup, doing marketing and teaching the body painting units. Working more in marketing is helping me think more strategically about my social media presence, which I am focusing on a bit more too as with some big opportunities in January 2019, I want to be prepared for the growth. I’ve also been working with the Queensland Ballet this year! They’ve been fantastic and I’ve realised how much I love theater and I am very keen on getting further into it. B - Taking time out for yourself as an artist is so so so so valuable. I’m glad you have found a way to balance things whilst you have a sort of sabbatical. I think freelancers get caught up in the constant hustle and forget that down time is just as important for your overall health. You don’t have to keep pushing every single day. Those students are lucky to have you! I actually have done similar myself… I have taken time away from running live MUA Bootcamps because it’s outgrown itself already. I’ve taken the time to explore my own personal art and have decided to add so much more to MUA Bootcamp as I see what else could be added… I’m even changing the name! MUA Bootcamp sounds so aggressive and hard work… and you know the course is so different to that. So,I’m in the process of a rewrite and rename… can’t bloody wait to share it. A lot of what we discuss in MUA Bootcamp are ways in which we can fuel our own creativity and practice ‘play’ in down times which is also a form of self learning and so important to the artist side of ourselves. What have you found motivates yourself to self learn in your work? B - He turned out amazing by the way! Yes, I completely agree with the importance of being curious about other sources of creativity. Body Art can so often be whittled down to a frivolous art form, even cheesy. You and I know there’s so much possibility for body art than just painting a naked form. What do you love the most about what you do? G - Just creating art. I just love painting and the bit where you are finished and you step back and go “wow I did really well today” or “this looks beautiful" is my favourite. B - What else have you learnt about yourself as an artist through body art? G - That I’ve had to let it go ha ha. I’m very much a perfectionist with my work and very detail orientated, which can be positive qualities, but I have learnt when to stop - I’ve recently been having hand issues from overuse which for me is a big wake up to “its okay if its not perfect”. B - You’re at 95.3K followers on Instagram and rising daily. How has more followers affected your career? G - It’s been weird. In some aspects its really helped me and in others not. I have had a lot of clients find me through social media, and I am building more brand relationships the larger I grow. I have been commissioned for exciting things from and for social media and my presence and relationship with Mehron is what is sending me to IMATS LA in 2019 to work with them which is crazy to me. In the more professional side of things, I have met older artists who have looked at me differently because I work with social media - it has made me feel I have to defend myself about my work which is weird. It’s hard to explain but there seems a bit of a tear between professional and “influencer” with social media and I am unfortunately right in the middle. Also I hate the term influencer so much!!! I am not an influencer, I hate being called it, that is such a negative term. I am a makeup artist who is able to do creator marketing. B - This is exactly what I thought was happening… the term ‘influencer’ slowly becoming an insult to a Professional Artist. I suppose these writings I do is a way for me to explore the other sides to social media for my own sanity. I’ve felt pressures myself to do ‘Influencing’ yet I only really want to talk about products I genuinely love and feel I do this already through editorial beauty notes and the occasional review here on my website. I certainly believe now there is a way to find a balance between artistry and PR but it’s a lot of trial and error for me. Do you find ‘social media makes artists’ feel like they need to embrace a certain “way of being”? G - Yes. My growth is stagnant (although the followers keep climbing, my engagement is), so I have come to the realisation I need to bring my personality to the table. It’s not just about the artist any more, its about the whole package. I feel the need to focus more on my YouTube or talking more on Instagram live/stories etc because that is what is working for larger artists and when I would make tutorials (I don’t currently, its too much work right now), people would be more engaging. I’m so shy in real life, I hate hearing my own voice too lol so its not something that is natural to me and I will have to work on that. ﻿B - I suppose you need to work out what is going to enhance your career and fuel the ability to make more work… but doing it in your own authentic way. I’m very much the same (against popular thought)… the idea of making videos in the currently format does not interest me in the slightest (whilst I can appreciate what people are making!) and there is no point putting energy into something I wouldn’t enjoy. But recently I think I have found a way I could make the kind of videos I’d like to watch which is exciting because in high school I wanted to be a film maker… so it feels a bit full circle. There’s still a part of me that resists making videos or even content I appear in. What a lot of people don’t realise, is I’m actually a bit shy and used to get stage fright so badly I had to be coached to learn how to publicly speak. So making videos brings all that up. I’m working on that in 2019 though and will have many videos in the future. I know you also as a quieter artist as well, would I be correct? G - Yes absolutely ha ha. I can be extroverted in some contexts; when I’m presenting at an expo or with closer friends etc but I am your definition of an introvert ha ha I need my down time. B - I’ve been so interested in this of late. Last year I finally came to the realisation that I should stop beating myself up for what I was doing on a daily basis that wasn’t what everyone else was doing, and I should just embrace the fact that I’m actually really introverted. People think Introversion means shy… however introversion just means we get energy from being alone… and extroverts get energy from being around people. It’s not one or the other either… it’s a sliding scale… a spectrum. And whilst people think I’m confident and extroverted… it’s in those times that I have spent time preparing for moments I need to be on show and most likely will retreat that night to a quiet place for reflection. Do you feel any pressures to be a certain type of person to elevate your artistry? What would they be? G - Yes as I mentioned earlier… I feel like I don’t have a pressure to be a certain person, but I need to be more out there. Perhaps a little bit more confident and outspoken than I am in real life? I feel like it doesn’t help dwelling on it because it’s always important to remain your authentic self (I could never imagine keeping up a persona 24/7) but I feel being confident, charming and outgoing is more attractive. B - You know, I originally started MUA Bootcamp to show a new way to train your own brush skills and get out of your own head… but as years have gone on I have realised it really is a space for artists to stop and take stock of their careers to date… and be in that conversation about forgetting trying to be a ‘makeup artist’ like it’s a template we have to fit into… but through conversation, giving artists permission to be themselves and pursue what ACTUALLY makes them feel fulfilled, not what they THINK they should be pursuing in their careers. It’s been a really beautiful journey to observe in so many artists who have done the course and really come into their own… and is the reason why I persist with creating this content - because I wish I had all this information when I first started. I think the fact we are here both talking about our secret shy selves will validate anyone the same reading this. In saying all that… Do you think it is possible to be a successful makeup artist who is quieter or shy or timid or anything outside of ‘Kardashian beautiful’ and extroverted? G - I would like that to be the case, but I’ve heard even a close friend remark about another artist: “its a shame she’s not attractive, her work is great” (I felt so uncomfortable with this ick). There is a huge focus on social media being this unattainable, incredible thing. Very rarely do you seem to find “real” people - you will only ever see the good aspects of their lives, they will never post an ugly selfie etc. In saying this, I feel like there has been a shift recently to try and be more accepting of different personalities and different looks. I’ve found personally that brands I have been with in person love me because I am very soft spoken and genuine and its almost a fresh sort of flavour? This is just on a tangent but I can distinctly remember when I was in a group environment with other artists, each person was name-dropping and telling the head artist all the incredible things they have been working on because there was the potential for further work. I kept quite reserved and didn’t push myself and the head artist turned to me and was interested in hearing about me. I spoke about my work and showed some photos and they were so impressed but mostly just so interested in me for being so “sweet, genuine and humble”. I’ve since been asked back to work with them again and hopefully with next year too. It may be harder to get your name out there if you’re shy or not “conventionally” attractive etc but if you can still get the hustle going, the attitude and talent will still be the deciding factors as to if someone is “successful” or not. B - What advice would you give to the quieter artists on how to get noticed on social media? G - Just keep putting your work out there! Social media is great in the sense that you are behind a screen so it feels less invasive, but its important to still post your work, still keep trying new things etc. Do the things you want to do, not just because they are on trend. B - Gosh… you were one of the first Artists to come and do MUA Bootcamp those years ago. Whats your favourite thing you took from the course? G - Breaking down goals. I wanted to go to IMATS LA and demonstrate my work there to the larger brands there and by breaking it down, I have been able to contact some connections and I will be sponsored by Mehron Makeup to do a demonstration on their booth. I am hoping to finish it early so I can wander around with some business cards also, as a walking advertisement for my work and Mehron. B - Amazing Yes I blooming LOVE milestone mapping and how it makes daunting goals seem totally achievable. What do you do for yourself that keeps you motivated to continue making work and strive for milestones? G - Motivation is the hardest thing for me but I have been recently focusing on something called “no zero days”. It’s been very thought provoking and so even if I have a day where I didn’t do a good paint (e.g. yesterday) at least I still did something. Even if I could only muster editing a photo, its still something. If I have a milestone on, I’ll try and aim towards that in my no zero days. I just want to create work that I am proud of, and if anything, that is challenging me. B - OOh I love that! That’s something I could definitely take on myself. I recently read an article about an artist who has found himself in jail thanks to circumstance, and I was so affected by his story and the thought he might not be able to make art in jail… I embarked on a ‘make art every day’ and haven’t stopped. It’s been incredible. I think we’re onto something! As long as we include self care in there and don’t burn ourselves out. What are you getting up to right now and what are you looking forward to releasing? G - I’ve been a bit quiet recently as I’ve had a bit of a difficult year but I feel like this week is the start of a very positive chapter. I am currently waiting for Make-Up Artist Magazine to release an online article about me which I am very excited about and is one of my milestones. I am also planning looks to submit to them for a print article. I haven’t shot any photo shoots this year so I am excited to work with my friend KTB again soon hopefully for the new Unleashed mag. And I am currently starting on some Halloween paints. B - One addition I am making to MUA Bootcamp is focusing more on the importance of play in your free time. As artists… sometimes we forget to treat ourselves as such and can get bogged down in the search for Makeup Artist success. Yet art play fosters SO MUCH CREATIVE LEARNING and FREEDOMS! Is there anything else creative you are passionate about that you spend your time on? G - I think you asking this has made me come to terms with what I have been experiencing for the last 2 months actually. I have been painting for 6 years and its been my hobby - I was lucky enough to then make it into my career from there. My problem was that by doing this, I no longer had an “outlet” craft - I had to do paints for social media or for clients etc. My once a week paint, which is still enjoyable, is still “work” so I wasn’t letting myself take a break or do something else creative. This year has been hard and when I haven’t been able to do my body painting, I’ve been feeling very down because I wanted to be creative but couldn’t do anything - it turned into a bit of a vicious cycle by November when I ended up sick half of the month! So this leads me to something I have picked up in the last couple of months - painting household items! Ha ha. I decorated some plant pots for my friends with flowers and cats as gifts and highly enjoyed the no stress of it. Unlike the performance art of body painting, I can put the pot down and come back to it in a couple of days to add more to it, work out what needs to be tweaked and just slowly add to it. Unlike the temporaryness of body painting, I can then pick mediums which are “useful” - so not necessarily a canvas, but by having an item you can then do something with such as grow a plant. Its been such a relaxing thing for me to do and it allowed me to rejuvenate my creativity to the point where this week I can’t sleep because I’ve just got so many creative ideas with IMATS coming up and I want to do so much - I haven’t had that in at least 6 months so it’s exciting. B - I 100% agree with you. In 2018 I found my internal voice complaining that I don’t actually make anything! So I have been playing with craft and art projects and the sense of fulfillment is amazing and I love it. I don’t think I can go back to body art being my only creative outlet ever again. This weekend I will be having serious IMATS fomo as I will be in NYC… but those who are in LA, where can they catch you? G - I will be painting 2 days (Saturday 12th and Sunday 13th) at the Mehron Makeup stand (booth 607).